Using a column template allows you to create a column with a unique look-and-feel. You can add any control to the template. A template column in WebDataGrid™ consists of 4 templates: header, footer, item, and alternate item templates. You will learn how to set up an item template for a column in WebDataGrid. This template will contain 2 link buttons to modify or delete a row. Bind WebDataGrid to a SqlDataSource component retrieving data from the Customers table. For more information on doing this, see Getting Started with WebDataGrid. In the Microsoft® Visual Studio™ property window, locate the Columns property and click the ellipsis (…​) button to launch the Columns Editor Dialog. Select a column in the Available Fields section, under TemplateField, and click the Add Field button to add a template column. Set the Key to TemplateColumn1 and Header Text to Edit. 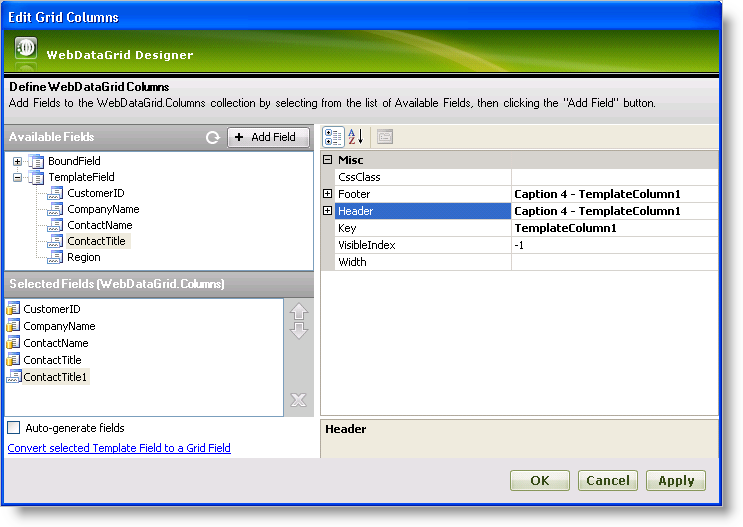 You can also select the column you intend to use as a template column from the Selected Fields section and click the Convert Selected Grid Field into a Template Field link. You can also add a template column in code. The code should be performed in the Init event of the page, on first load. Right-click WebDataGrid. Mouse over Edit Template from the context menu and select the column template you have just added. The template is shown in the designer. Drag 2 LinkButton controls onto the Item Template area. Set the Text property of these buttons to Edit and Delete. Set a handler for the client-side click event of the buttons by using the OnClientClick property. For the Edit button, set the property equal to "return editRow()." For the Delete button, set the property equal to "return deleteRow()." You can do the above steps in code by creating a class that implements the ITemplate interface and set an instance of it to the ItemTemplate property of the column. For this sample, the instantiation of the template should be done on the PreRender event of the page. : A template needs to be re-created on every postback; therefore, you must perform the following code on every postback. Add the functions to edit and delete. Since the buttons function to modify WebDataGrid, you must enable the EditingCore behavior. For more information on doing this, see Editing. You also need the Activation behavior. For more information, see Activation. Since the item template is just HTML within the cell of a column, be sure to make the column read-only to prevent editing of the HTML. Doing this allows your end-users to edit using any editors in the template but prevent them from editing the actual markup of the template. For more information on adding column settings for a behavior, see Setting Column Settings for a Behavior. Run the application. WebDataGrid has a column that displays 2 link buttons which handles editing and deleting rows.